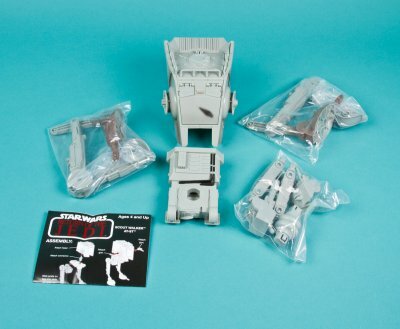 Originally planned as an Ultimate Battle Pack that was to also include the forthcoming AT-ST Driver and Ewok 2 packs, Hasbro changed up and issued them separately instead. The 3 K-Mart pieces have the same theme and sceen scene, and with Return of the Jedi's 30th anniversary coming up in 2013, a little early but welcome nonetheless. 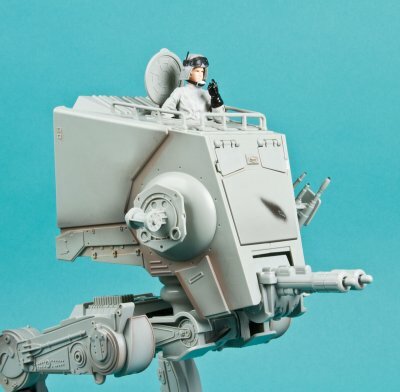 At $34.99 for the AT-ST that's $5 away from Target's 2010 Attack on Hoth set, we can probably make a safe assumption that those 2 packs will both be much more than an Abe Lincoln and collecting all 3 K-Mart pieces pricier. But will they be worth it? 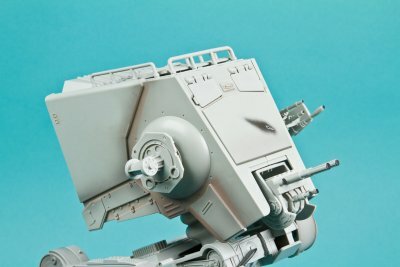 FEATURES: This AT-ST's paint scheme is based on Tempest Scout 2, the AT-ST unit piloted by Major Marquand (that's the director of ROTJ) and Lieutenant Watts (the film's co-producer). 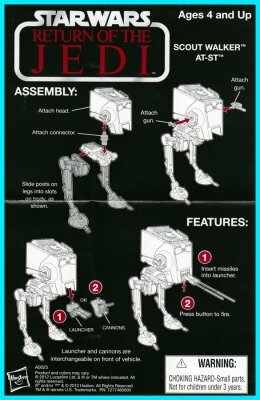 The AT-ST 2 pack figures will be based on these 2 Imperials though Hasbro cannot "officially" state the "actors'" names. Tempest 2 was hijacked by Chewie and a couple of Ewoks (the other 2 Pack) and later commandeered by Han Solo. 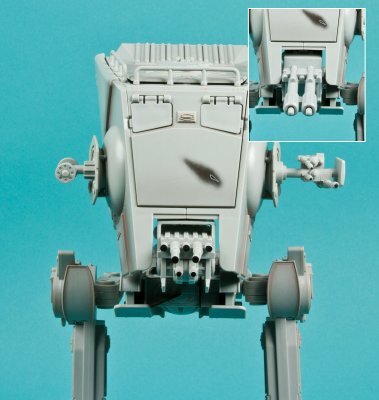 Hasbro included some specific paint ops on this vehicle that features the famous "scar" or battle damage on the nose. 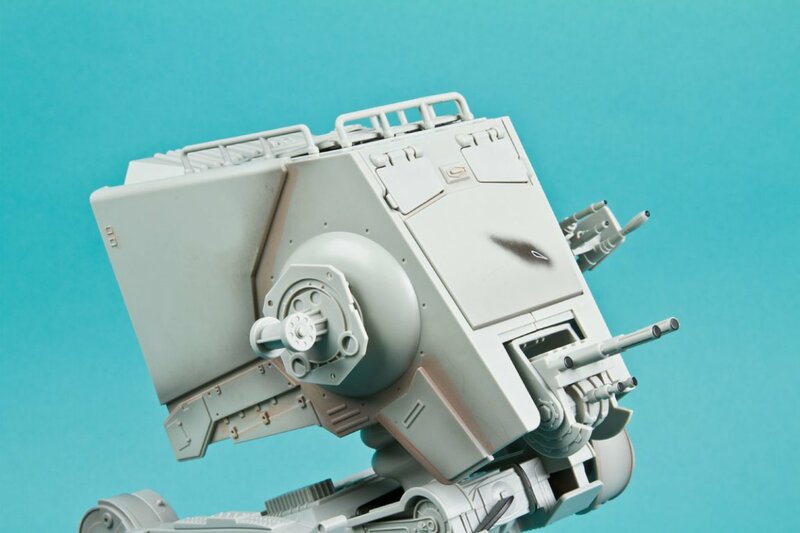 Additional deco that differentiates it from 2009's, and of course 2010's Hoth version, are applied. 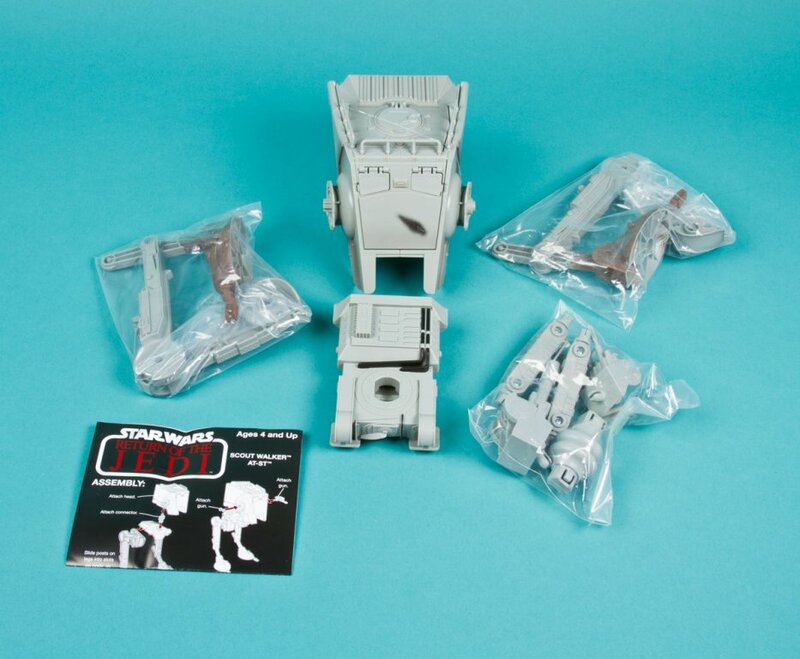 The feet look rather "chocolatey" for Endor dirt and mud and unlike the LC version, the foot supports are molded and no longer detachable. The attachments and weaponry are no different. 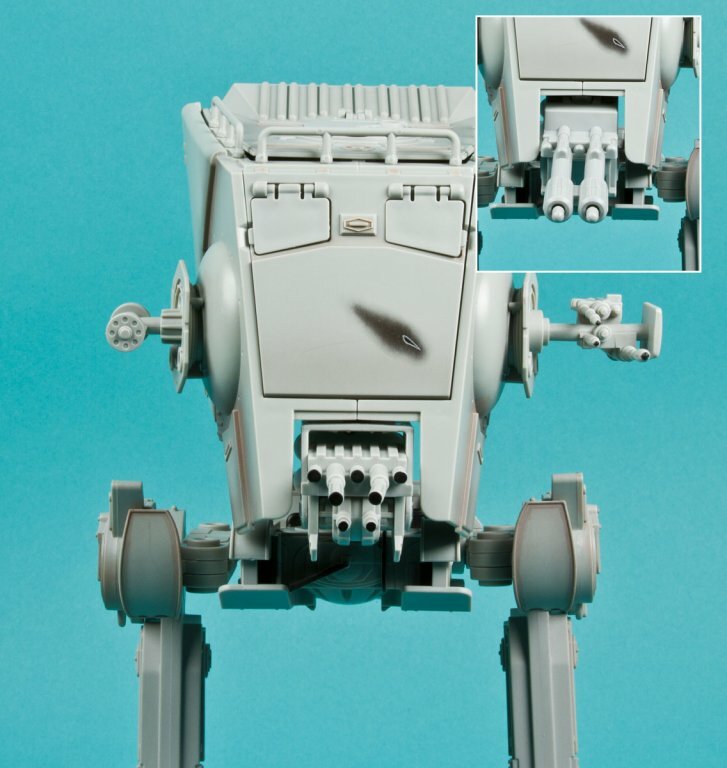 It includes the interchangeable chin guns with one featuring two firing projectiles. The cockpit also remains unchanged with the pre-applied control panel stickers still there. It remains the same overall vehicle from 2009 but I have to say that the deco is a good improvement, especially with that nifty and distinctive "scar". Unlike 2009's, there are pieces to assemble, so Hasbro included a guide. Because you have to pop the leg pieces in place as opposed to being pre-assembled, the points of articulation aren't as steady as they should be and there's a bit of top heaviness to the vehicle that makes it difficult to balance. You'll have to exert more effort posing it in various ways. 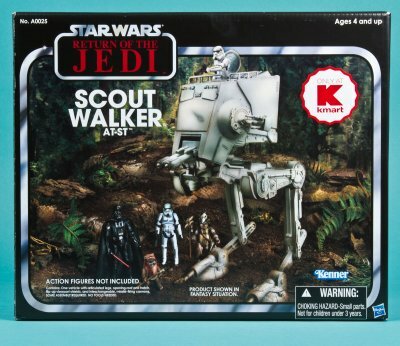 PACKAGING: The original Kenner package art was faithfully recreated featuring modern Vintage Collection figures and that's always damn cool. Hasbro could've chosen to put the new AT-ST Driver in the cockpit, but the choice they made in keeping the same Kenner figure representation is inspired and that Kenner logo always warms my heart. The box isn't as vertical as the original Kenner that probably makes it more retail shelf stackable. 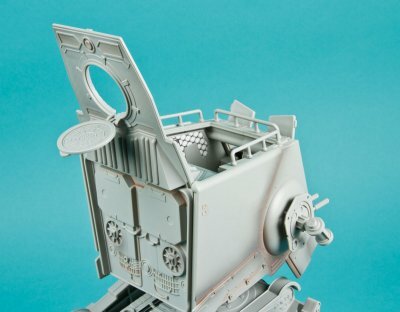 The package material also has a little more gloss and not as matte as the B-Wing, which should help it endure more shelf wear. The Walker comes 2 per case. TOPPING THINGS OFF: It's different and distinctive enough from 2009 in terms of deco and is an overall improvement. 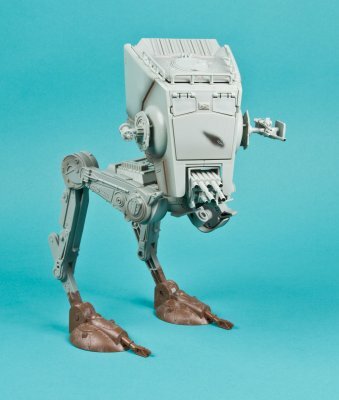 And while that release for Walmart included its own unique figure and was $10 more, this 2012 K-Mart exclusive will be compatible with 2 much improved and unique AT-ST Drivers that will end up probably costing a little more. The film specificity of the 3 exclusive pieces are great, and I'd rather have this and pay a little more than a re-issued, kit-bashed, value minded pack in figure. The Vintage Collection packaging is awesome, but you knew I'd write that. Although 2013 is about Droid Factory, it's great that Hasbro still plans to release Vintage Collection packaged exclusives for next year. Nothing against Attack of the Clones, but it's Jedi's 30th birthday and I'm always old skool at heart (*cough* Sail Barge *cough*). If you already have 2009's and collect loose and to display, the new and distinct deco may not be enough to justify forking another $35. But if you don't have the new and superior AT-ST mold or the updated deco appeals to you, especially with that cool distinct nose scar, then this Scout Walker you must have.